It was Kyoto School scholar Shuji Wada who went to study with the Dutch educationalist Martinus Jan Langeveld (1905–1989) in The Netherlands in the 1960s. He invited him to visit Kyoto after his retirement a number of times and saw that Langeveld’s main work was translated into Japanese. 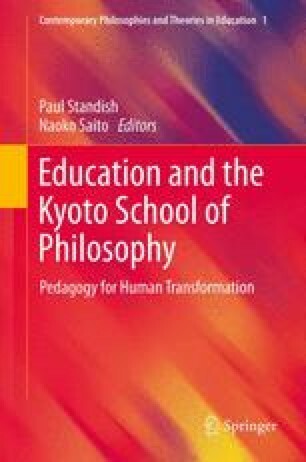 That’s the way Langeveld’s thought became of great impact of the Kyoto School as a whole. This chapter focuses on Langeveld’s theoretical work. After a brief introduction to his life and work, Langeveld’s outlook on his subject is explained: pedagogy as practical science. Then his pedagogic theory and how it links in with anthropology and developmental psychology are explained. His particular use of the phenomenological method is examined next, showing how this connects with situation analysis: the analysis of what those who are responsible for bringing up children are to do. Finally Langeveld’s relevance today is considered.